If you were asked to describe your electric cooperative’s system, you might say, “Poles, wires and those round gray things.” Round gray things? That is often the description given for transformers, the pieces of equipment crucial in converting electricity to a voltage that is safe for use in homes and businesses. So, how do they work? First, transformers are nothing like those creations of the silver screen. They don’t transform from vehicles to incredible combat robots. Instead, they transform the voltage of the electricity that passes through them. Here’s how they work: Electricity loses voltage as it is transmitted due to the resistance in wires and other components. As a result, higher voltages are used to offset these “line losses,” as electric utilities call them. It all starts at the power plant. There, generators produce electricity at high voltages and use transformers to step up this voltage. For example, in Colorado, Tri-State Generation and Transmission — the power supplier for 43 not-for-profit electric cooperatives and public power districts in Colorado, Nebraska, New Mexico and Wyoming — sometimes steps electricity it generates up to 345,000 volts. Since the power plants are far away, these voltages are necessary to survive the trip over the system to where it is needed. Transmission lines connect to substations full of transformers and other control gear. 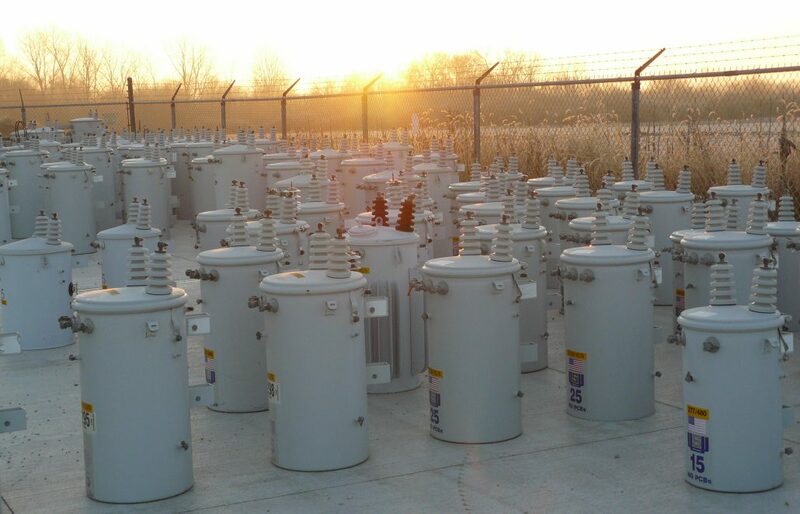 Here is where the transformers step down the voltage to safer, more manageable levels. Depending upon the distance involved to the farthest member and the amount of load served, distribution voltages can range from 7,200 to 24,900 volts. A couple more step-downs and the electricity arrives at your home at 120/240 volts. This is quite different from the original voltage. Regardless of the shape and size of the transformer, they all work in the same manner. Transformers have two sides, a high-voltage side and a low-voltage side. In normal operation, electricity flows into the transformer on the high-voltage side where it goes into a coil of wire, usually wound around an iron core. As the electricity flows through this coil, it creates a magnetic field that “induces” a voltage in the other coil. Here is where the magic (aka physics) of transformation takes place. Each coil has a different number of turns. The greater the number of turns, the higher the voltage. The coil on the high side will have more turns than the one on the low side. As a result, the voltage induced on the low side is less. Then transformation occurs. Transformers aren’t just limited to utility use. They can be found everywhere in our daily lives, even if not so obvious as those on your electric cooperative’s system. The best example is the charger that all cell phones and many other electrical devices come with. 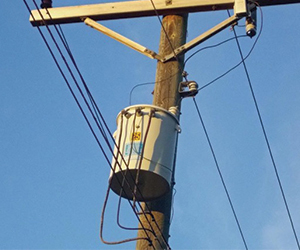 These small cousins of utility transformers basically perform the same function. Charging your cell phone with 120 volts will fry it instantly. So, the charger converts the voltage to a more tolerable direct current. Take a moment to look around your home and see just how many of these miniature transformers you have. You might be surprised. It is important to note that transformers work in both directions. Electricity flowing in on the low side is stepped up to the voltage of the high side. This is why electric co-ops educate members on proper connection of home generators. A generator feeding 240 volts into a residential transformer will produce whatever voltage the transformer is rated for on the other side, creating a deadly risk for line crews and your neighbors, which is why your co-op asks you to connect your generators according to the manufacturer’s recommendations. It’s always best to be safe. Tom Tate writes on cooperative issues for the National Rural Electric Cooperative Association.